Why Donald Trump Likes To Surround Himself With Generals High-level military brass may be able to bring discipline and order to an administration that sometimes has appeared to lack them. 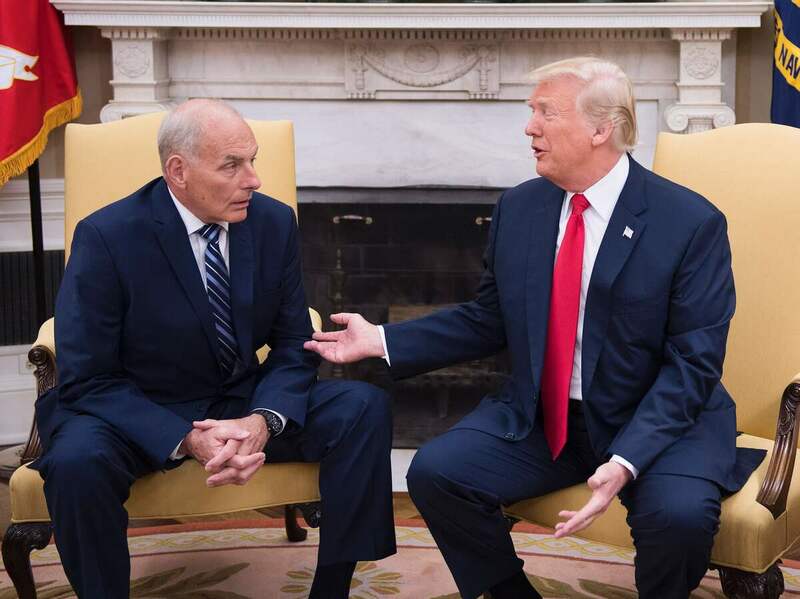 President Trump speaks with newly sworn-in White House chief of staff John Kelly at the White House on July 31. Kelly is one of four former generals who were appointed to top administration positions. When White House chief strategist Steve Bannon was pushed out of his job last week, it underscored the growing clout of President Trump's chief of staff, John Kelly, a retired Marine Corps general. And when Trump announced he was increasing U.S. troops in Afghanistan on Monday, after suggesting for years that he wouldn't, administration officials were quick to note that he was heeding the advice of "the generals." Trump, who attended the New York Military Academy as a teenager, has made clear he admires the toughness and discipline of military life and has appointed four former generals to top administration positions. "I think that he likes the idea of military leadership, because military leadership is very decisive and audacious at times, and general officers are very good at simplifying problems and then getting the job done," said Thomas Kolditz, a retired brigadier general and the director of the Doerr Institute for New Leaders at Rice University. But as much as Trump reveres the military, his own management style could put him in conflict with the very generals he has appointed. Leadership is a core part of military service, and promising recruits are taught from the beginning how to inspire and command respect. "The heart and soul of who we are in the military is about leadership, and leadership on a day-to-day basis but very importantly leadership in combat," said retired Marine Corps Gen. John Allen. "So recruiting young men and women who have those skills early in their lives and then working hard to foster and nurture those skills are very important," he added. Those qualities can make a big difference later on, when those men and women leave the military and venture into public life or the corporate world. Former Procter & Gamble Chief Executive Robert McDonald attended West Point as a young man and later served five years in the Army, before leaving for a corporate job. He had to make certain adjustments, he recalls. Because people in the Army move around so much, they're provided with manuals telling them how to do everything. "So when I got to the Procter & Gamble Co., I went to my boss and I said, 'Where's the field manual that tells you how to organize your desk?' And of course they thought I was crazy," McDonald said. But the leadership skills he learned in the military stayed with him throughout his career. McDonald likes to cite some words from the West Point Cadet Prayer. "Those words are, 'Help me to choose the harder right rather than the easier wrong.' And it's remarkable, but in business as in life, the easier thing is usually the wrong thing to do," he said. Carola Frydman and Efraim Benmelech, professors of finance at Northwestern University's Kellogg School of Management, have studied the track records of chief executives who served in the military. Among their findings: CEOs who are also vets are more cautious about spending money on research and development, and they tend to commit less corporate fraud. They also don't tend to do any better than other chief executives, the research suggests. But Frydman and Benmelech say CEOs who are also vets do tend to perform better during economic downturns. They can be good in a crisis. "They bring the capacity to operate under stress, and in so many cases, this stress has been tempered in the hot flame of war. And you just can't pay enough for that kind of experience," Allen said. That may be one of the qualities that appeal to Trump, whose administration has been plagued by leaks, aborted policy initiatives and high-level staff defections. But Kolditz notes that Trump may not fully grasp the ethos of public service and loyalty to the country that military officers are brought up in. "Donald Trump's grown up in a scrappier place, where it was pretty much about making money for yourself, and he is brand new to public service," Kolditz said. "Many of the things that Donald Trump expects from his people require [their ideas about public service] to be set aside for personal loyalty to Donald Trump. And so we're going to see this meeting of the minds, and I think it will be a process of consistent negotiation in how things happen," Kolditz added. "What he's looking for is success," Allen said. "And so in his mind it would seem he has concluded that among the many other people that might come into the administration, retired generals offer perhaps a time-tried and battle-proven executive who can come into the administration and provide critical leadership in key positions. "And with Kelly, Mattis and McMaster, he has certainly found three of the best and he has placed them I think in three pretty critical positions," Allen said.